Hey Everyone! Happy Tuesday! Do you ever find yourself looking for a quick, and easy breakfast a bit more nutritious than your morning cereal or that cup of coffee you claim is all you need in the am? 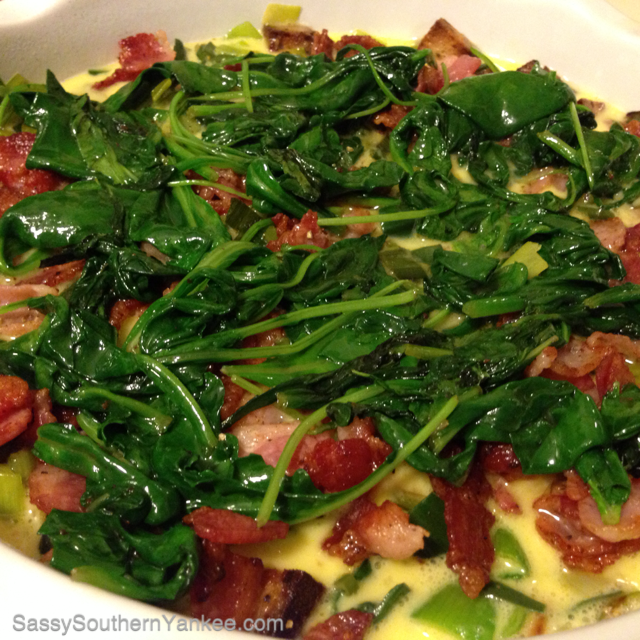 This Bacon, Leek, Spinach and Swiss Quiche is sure to hit the spot! It’s packed full of protein to keep your tummy quiet until lunch, so you can focus on your daily to do list. I like to make this on Sunday then slice it into 6 servings so I have one each day including Saturday. Then on your busy workday morning pop it into the microwave for 45 seconds and you are out the door ready to start your day! Leeks should be firm and straight with dark green leaves and white necks. Good quality leeks will not be yellowed or wilted, nor have bulbs that have cracks or bruises. Since overly large leeks are generally more fibrous in texture, only purchase those that have a diameter of one and one-half inches or less. Try to purchase leeks that are of similar size so as to ensure more consistent cooking if you are planning on cooking the leeks whole. Leeks are available throughout the year, although they are in greater supply from the fall through the early part of spring. Fresh leeks should be stored unwashed and untrimmed in the refrigerator, where they will keep fresh for between one and two weeks. Wrapping them loosely in a plastic bag will help them to retain moisture. Cooked leeks are highly perishable, and even when kept in the refrigerator, will only stay fresh for about two days. Leeks may be frozen after being blanched for two to three minutes, although they will lose some of their desirable taste and texture qualities. Leeks will keep in the freezer for about three months. Pre-Heat the oven to 375*. Spray a pie pan or 8×8 casserole dish with non-stick cooking spray. Chop the two pieces of bread into 1/4 inch pieces. 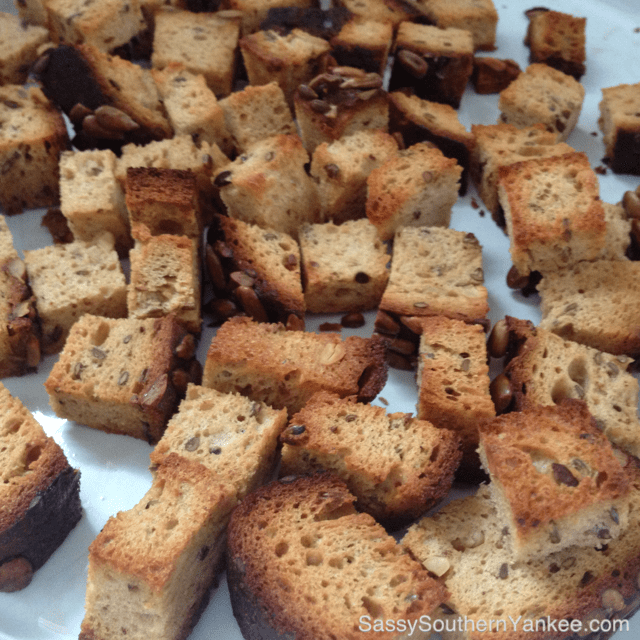 Place them in your prepared pan and bake in the oven until toasted. (You can also use the toaster oven). 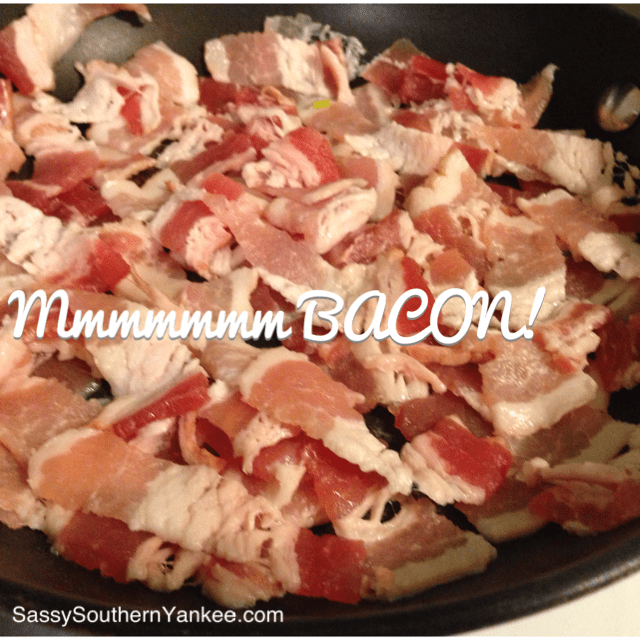 In a medium skillet cook the bacon until crisp. Remove the bacon and drain on paper towel. In the same pan that you cooked the bacon sauté the chopped leek until translucent and soft. Remove the toasted bread from the oven. Place the bacon and sauté leeks evenly in the casserole with the toasted bread. Just toss it together the nice thing about quiche is it doesn’t have to be perfect to be delicious! In the pan you just removed the leeks from add the garlic saute for one min until fragrant. Add the spinach and cook until wilted and the moisture is gone. Add the spinach and garlic to the casserole dish. In a medium bowl scramble the eggs. Add the salt and pepper and pour the egg mixture over the yumminess in the casserole dish. 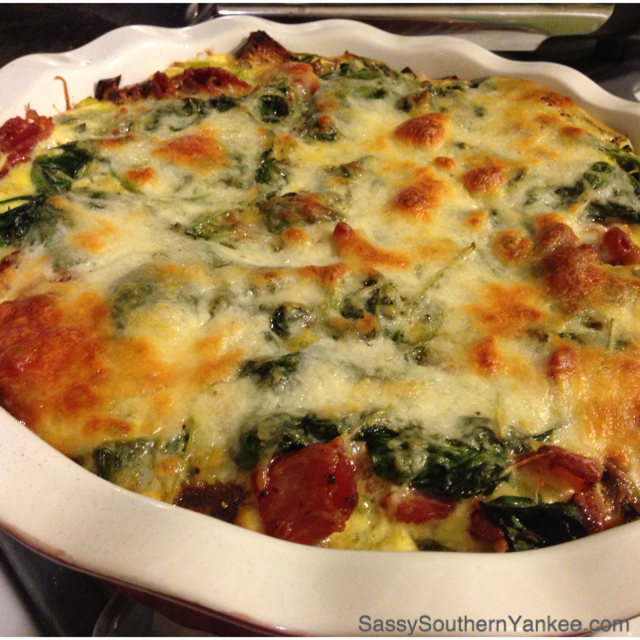 Sprinkle the cheese over the egg mixture and bake for 30 min or until the center of the quiche is cooked through. Remove from the oven and allow to set for 5 min. Serve quiche immediately or place in the fridge to eat throughout the week. Pre-Heat the oven to 375*. Spray a pie pan or 8x8 casserole dish with non-stick cooking spray. Chop the two pieces of bread into ¼ inch pieces. Place them in your prepared pan and bake in the oven until toasted. (You can also use the toaster oven). Remove the toasted bread from the oven. 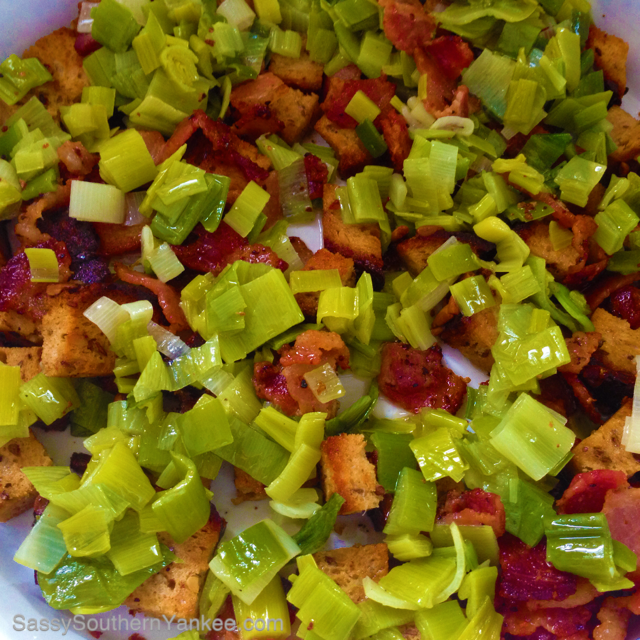 Place the bacon and sauté leeks evenly in the casserole with the toasted bread. In a medium bowl scramble the eggs. Add the salt and pepper and pour the egg mixture over the yumminess in the casserole dish. Sprinkle the cheese over the egg mixture and bake for 30 min or until the center is cooked through. Remove from the oven and allow to set for 5 min. Serve immediately or place in the fridge to eat throughout the week. This entry was posted in Breakfast, Main Course and tagged Bacon, Breakfast, Breakfast bake, Brunch, Egg, Gluten Free, High Protein, Leek, Leek and Swiss Quiche, On the go meals, Quiche, Swiss Cheese. Good Afternoon! There is a subscribe to e-mail option on the main page at the top. You can also follow us on Facebook, Pinterest, Twitter and Linkedin if you like. Please let me know if you need any additional help signing up.